We thought our East Coast Road Trip was colossal. Then we decided to do the Pacific Northwest. Here are the details of our Mega Road Trip through some of nature's finest eye candy. Then about 10pm we drove out of San Francisco over the Golden Gate Bridge and stopped at one of the first RV parks we found. The office was closed with a sign offering available spots. There were none. It was 11pm and I couldn’t drive a second more so we parked in the parking lot in front of another RV and set up home. Our new Jucy Campervan was surprisingly easy to setup and we were all quick to fall asleep. 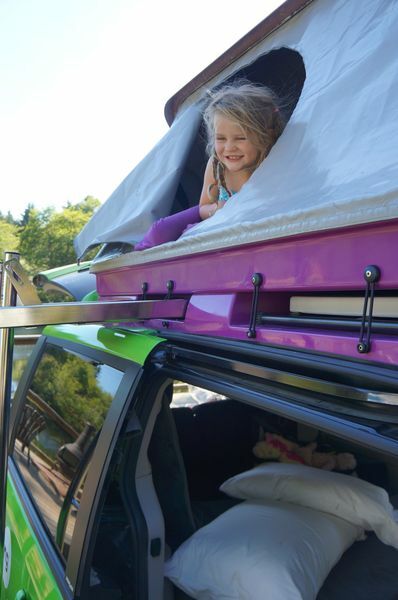 Read all about our awesome “Champ” in our campervan post. I was awakened early by a knock on my car door – yikes! What a fright to get at 6:45am. The RV we had parked in front of was hoping to leave and were asking us kindly to move. Well it would have been more kind to ask when they did leave an hour later, but I quickly jumped in the drivers seat and moved over a bit so they could easily get out. By then everyone was awake so we all got up and ate breakfast. We decided to pack up and hit the road. The office never opened so we simply left, having not used any facilities, but the toilet. We spent a full day driving, but with plenty of stops as we drove through California’s Redwood forests - such incredible beauty. Our first stop was the Drive-Thru Tree. Entry is $5 per car. 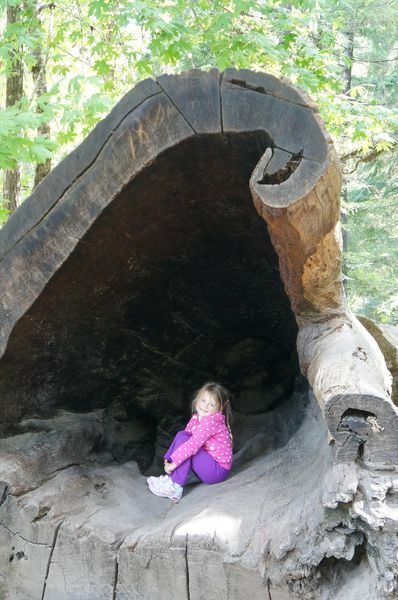 Our car was too tall to make it through, but we still got some great pictures of this 2400-year-old tree. 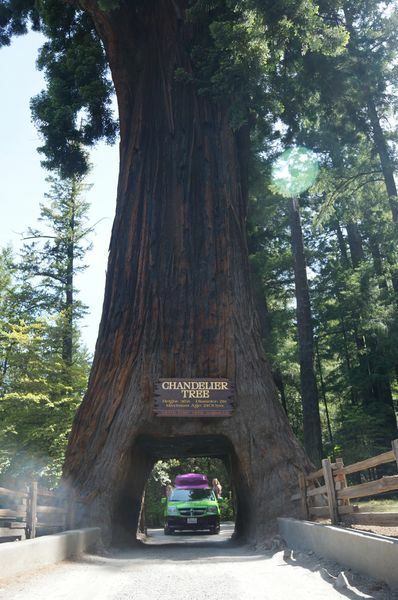 After our brief stop here we came upon the Avenue of Giants and decided to make the detour from Route 101 to the scenic alternative. The Redwoods stretched above us, strong and tall, providing us with shade and beautiful greenery. They were silent witnesses to countless stories that unfolded in the forest floor below. We stopped in Eureka for lunch, just because it sounded good and continued on to Trinidad. Our original plan was a free stay at a casino parking lot, however on inspection we realised “free stay” means no toilets or power and decided that was not going to work. 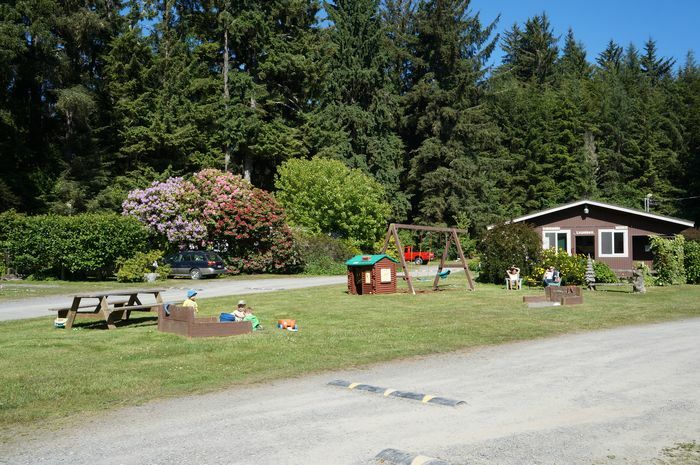 Further down Patrick Point Road is plenty of RV parks to choose from and we were quite picky wanting wifi and a domestic powerpoint, not an RV point. We finally found Azaela Gardens. The lovely lady welcoming us charged $45. We were parked opposite a playground, bathrooms and laundry. Behind our lot was a wood deck with the most amazing views of the pond and surrounding forest. We spent the afternoon watching the kids play on the playground with our neighbour’s children (from Switzerland) and setting up camp. Our gas bottle ran out in the middle of cooking dinner so we were blessed to be able to use our new friend’s stove in their RV. It was a fancy-looking thing, very roomy, although I imagine pricey on the fuel and not as easy to pull in to attractions or supermarket car parks. We ate our soup with bread and then put the kids in the penthouse while we continued to catch up on work and blogging on the lower level. Around 10pm a light misty rain started so we packed up shop and each headed to our separate beds. It was unfortunate that night was cold and wet. By 6:30am my husband’s mattress was wet from an invisible leak. The next day when we rang Jucy about this they were amazingly helpful. They gave us several options including buying a two person tent and being reimbursed. We ended up at Walmart looking at the tents and decided a tarp would work better so we could still use the penthouse, which was very easy and fast to setup. I was super impressed with the speedy service Jucy provided and their willingness to bend over backwards. We still have no idea where the leak is, but have had no problems since this one night. We started our day late, as it was wet and rainy. We ate cereal in the comfort of our Jucy camper, where the beds convert into a table with chairs. Genius, I mean they have thought of everything. The kids watched some DVDs in the camper’s DVD player, while Josh and I finalized our work. Today we did not make many stops. We drove down the Oregon Coast watching the waves crash against the mounds of rock which jutted out into the ocean like a foreign invading army, and admired the scenic views. We stopped in a small, non-descript town at a restaurant that caught our eyes. The Crazy Norwegian’s Fish & Chips. It was delicious. After lunch we continued to drive until we passed Coos Bay and hit North Bend. After last night’s rain we were slightly concerned and, on advice from Travel Astoria-Warrenton, decided to stay at the Mills Casino. We needn’t have to worry as the weather was warm and there was no rain. Mills Casino is a casino hotel located on a river with magnificent views. We were offered a room with 2 queen beds on the 7th floor overlooking the striking views. The room was a great size with a huge bathroom and yes, a wonderful showerhead. The beds were super comfy and warm. Everyone was tired, especially my husband who fell asleep at 6pm. He must have really enjoyed the big, soft bed. I ordered room service for myself and the kids and they almost polished off a whole pizza while I indulged on a delightful chicken salad. We all showered and hit the sack. We all awoke lazy and happy in the Mills Casino. I had grand plans to take the kids to the pool, but after phonecalls with my parents and Josh’s parents the day was already escaping us. The staff at Mills Casino were delightful offering us free valet and surprising us with a bottle of Moscato, and we were melancholy to be leaving. That is until we realized that less than 15 minutes away was SpinReel. 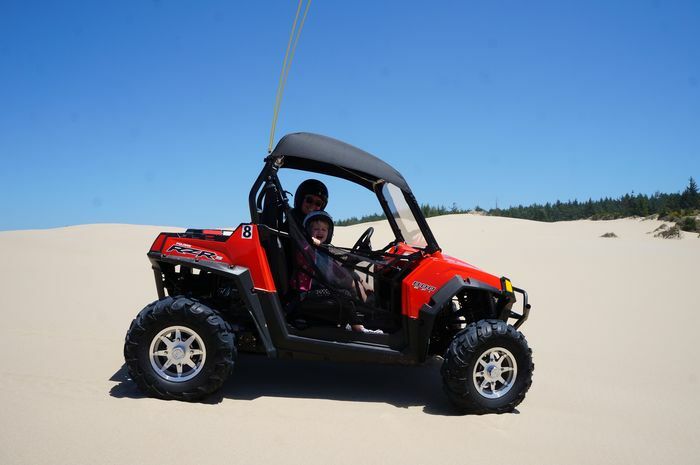 SpinReel is set in the Oregon Dunes and offer ATVs, dune buggies and other crazy vehicles for exploring the nearby dunes. I don’t recall ever seeing dunes since we left Perth and we were stoked. We decided to hire a 4-seater buggy for one hour at $175. Fortunately for us someone had just broken it and we were allowed to take out two 2-seater buggies instead. I say fortunately, because I know there would have been a big argument over who got to drive. After a brief safety video, signing disclaimers and an explanation of the charges for rolling or damaging the cars, we were equipped in helmets and given free reign of our vehicles. 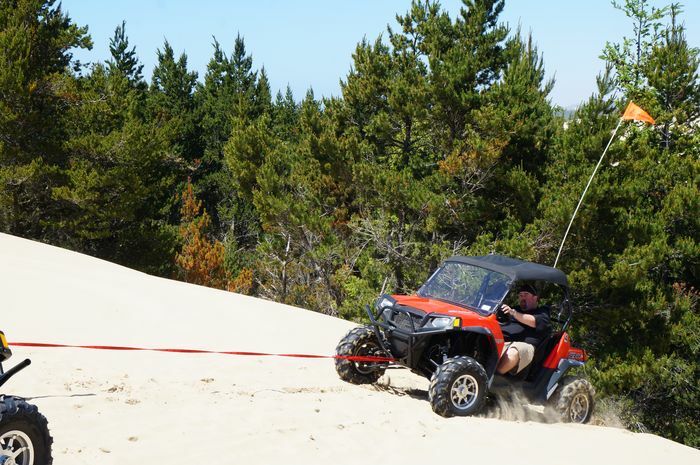 A quick drive through an RV park and we were in the dunes. 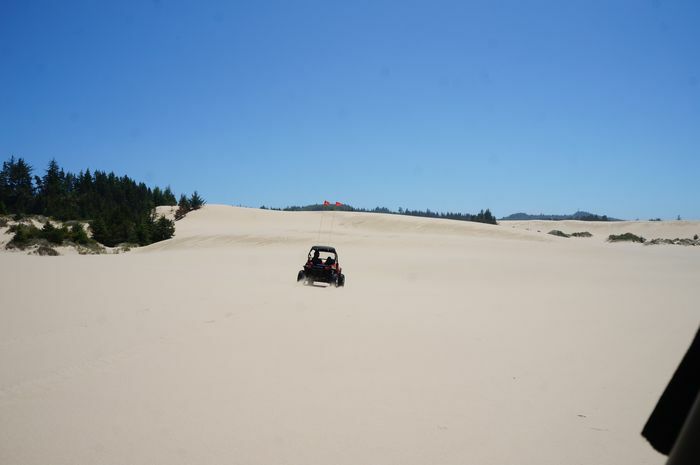 Big, giant, sandy dunes with no ocean in sight. We were driving up crazy heights and plummeting down ever crazier ones. I got stuck on one hill, but managed to get out with the help of my husband. It was all great fun and Mia was yeeha-ring and yoohoo-ing until that final time. I slammed my buggy into a narrow path and was up and over the hill with success, yay… Then, I looked back. No Josh. Mia and I turned the vehicle around and headed back to the crest we just mounted victoriously and low and behold at the bottom was Josh and Caius sideways, wedged into a bush. Josh had been a little too far to the right and the sand had collapsed under his tyres sending him plummeting down the side. After several attempts at him pulling with me on the gas, we realized we had just gotten ourselves into a deeper ditch and had to call for help. Caius started claiming land left and right with the snapped-off flag Josh had managed to take off as he crashed into the trees, while Mia and I returned to the buggy to do some more laps. When we arrived back the Owner, Rich, was surveying the damage and laughing long and deep about those “silly Aussies”. 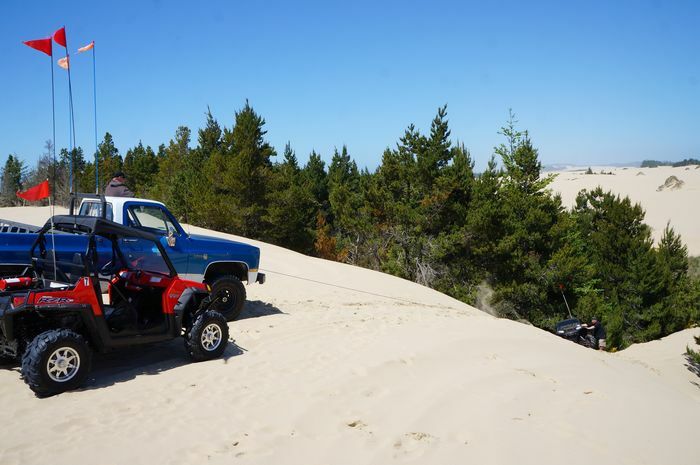 He called his ute and they had to winch and cable the buggy to the ute and bring it up the dune. By this time our hour had gone. Rich was absolutely lovely asking us to follow him back. Josh hesitated on one dune he went down and seeing that Rich decided we could not come all the way to Oregon dunes without doing “the big one” and we followed him down the most amazingly high dune. Mia laughed and wanted to do it again, but it was time to finish. What a great day we had. I highly recommend spending some time at SpinReel. Despite the crash-and-burn of one Mr Joshua (who’s the better drive now, hey? 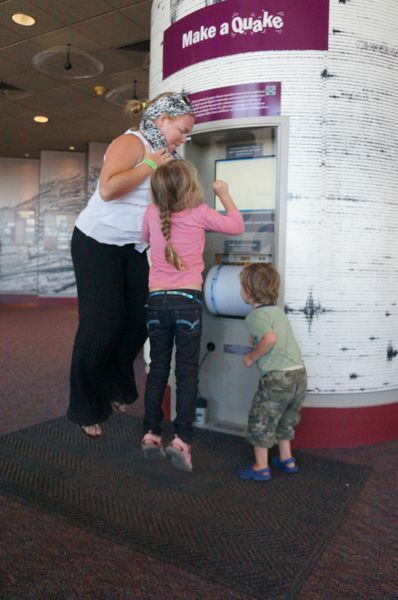 :) it was an exhilarating and exciting experience that even the kids loved. 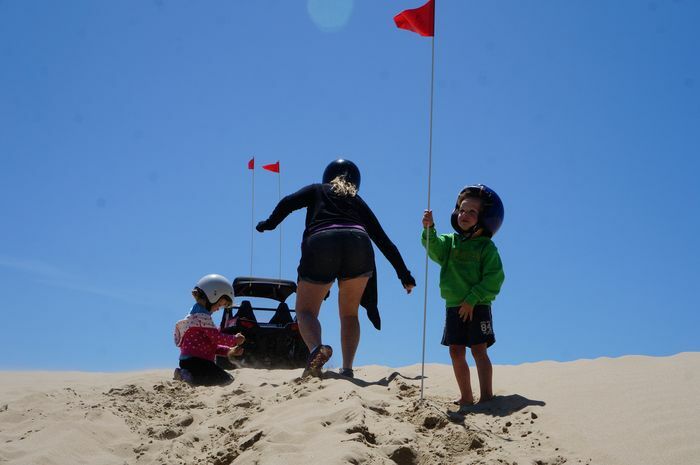 Well, Mia did, Caius was asleep by the time we got back, completely missing the big dune run. It was 3pm by the time we emptied the sand dunes from our sneakers and jumped back in the car, a very late start, but a happy one. We stopped several times over the next 6 hours at supermarkets, walmart, toilets, restaurants and more. We never found a gas can for our stove. It was late when we pulled into Ainsworth State Park. We backed the van into a lovely spot surrounded by bush and mountains, set up home and put the kids to bed. Josh and I did some writing before lights out. I had decided to sleep top-to-toe with Mia this time and slept much better then previous times. I was very surprised when morning had arrived, felt like I just closed my eyes. When we woke the views were phenomenal. We had a quick breakfast and packed up the house. Mia made friends with the neighbours again and the older man came over to tell us how delighted he was with meeting her. She is our little social butterfly. She also loves telling everyone we are from Australia; she understands that’s quite special. 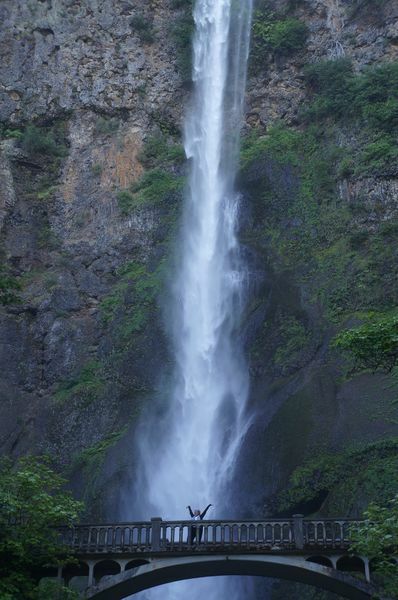 Being so close we decided to stop at Multnomah Falls first and witnessed several other falls along the same road. 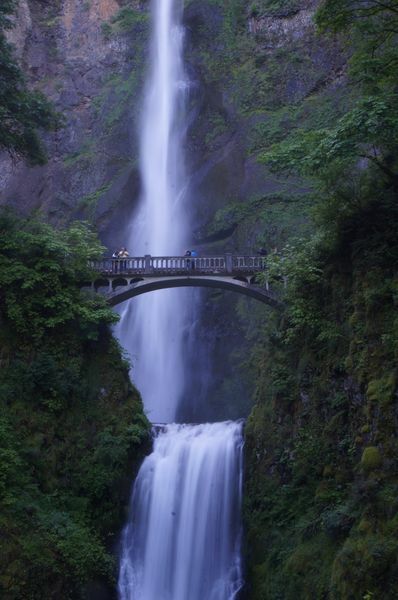 Multnomah was beautiful and much larger than expected. Actually, it’s much taller than Niagra Falls, but clearly not as wide. Mia, Caius and I climbed to the viewing bridge, but it was cold and wet so we headed back down. After the falls we decided to drive to Mount St Helens to view the devastating volcano that hit Washington in May 1980. The drive was much further than expected, but was definitely worth it. The volcano is snow capped and beautiful. At this time of year, in early June, there was even snow on the edge of the road as you drive to Johnston Observatory. 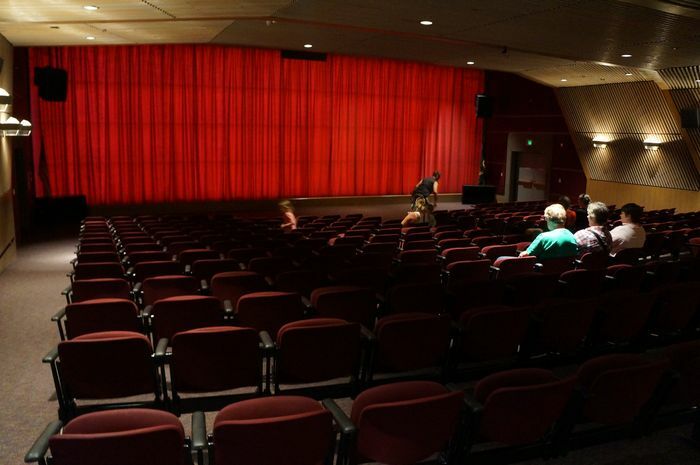 The viewing from here was $8 per adult, under 15 free. 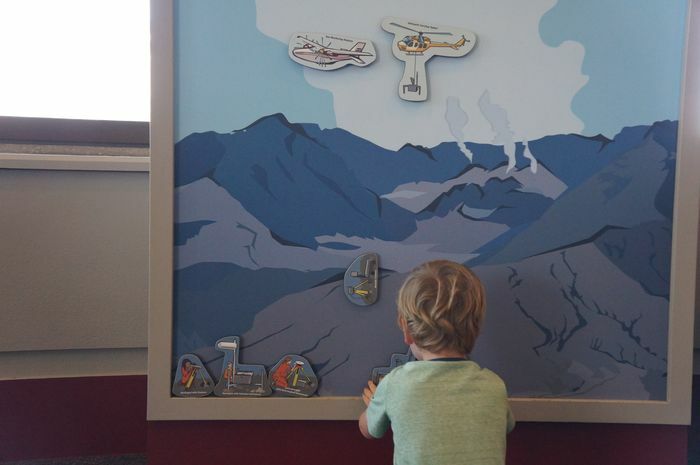 This includes access to ranger talks, two informative movies and the trails around about, plus an awesome little scientific-y museum all about volcanoes. Once again the views were phenomenal, especially the surrounds where we could witness the effects of that blast 30-odd years ago. I actually learned a fair bit during the one movie we watched and we enjoyed teaching the kids all about volcanoes. After a bite to eat we were back on the road at 3:30pm. Originally we had planned to stay in St Helens overnight, but since the kids fell straight to sleep we decided to push through to Seattle so that we could start in on the city the following day instead of travelling. A travel-free day sounded awesome to me after so many miles. Josh took the wheel so I could do some writing and we hit the RV park around 6pm. We still hadn’t managed to locate gas bottles, however the RV beside us was so generous in loaning us their microwave and stove. I cannot recommend this RV park though. Compared to the beautiful, scenic places we were staying in previously, the gravel grounds and lack of nature was not at all how I pictured camping. They had electricity, a pool and a playground though, which the kids made use of while I tried to find quarters to do my laundry. We had a wonderful dinner, some movie time and then bed. All photos can be found in our Photo Journal here. 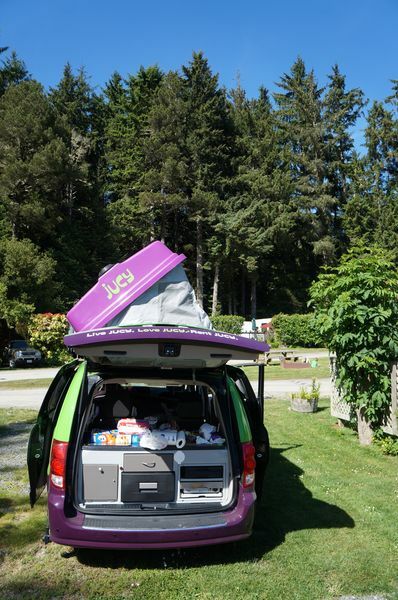 Check out our Jucy Campervan. I love long road trips like this! It looks like you are having wonderful adventures. We haven't yet made it to that part of the country- hoping to take a trip much like yours next summer. Your pictures make me even more excited... And your camper makes it look so easy! We spent a few months in the States & Canada earlier this year and the one thing we came to love was: driving! We came to love the road trip, miles of endless (and straight) roads. Cruise control set to 100kph and some great music on the radio. Not many things in life are so simply enjoyable! LOVE this post and will now add you to my LONG list of favorite blogs to follow! 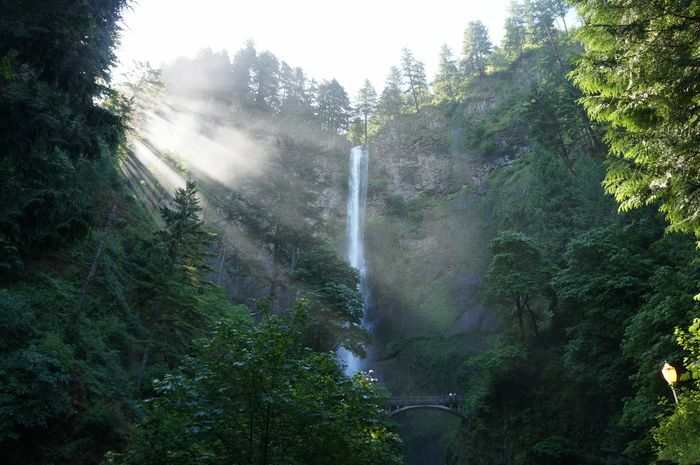 I have done this road trip before (slightly different--Los Angeles to Ashland, Oregon by way of PCH (when our kids were 8 and 5, along with my Mom and we camped at KOA campgrounds in cabins) and along the Oregon Coast with my Aunt. 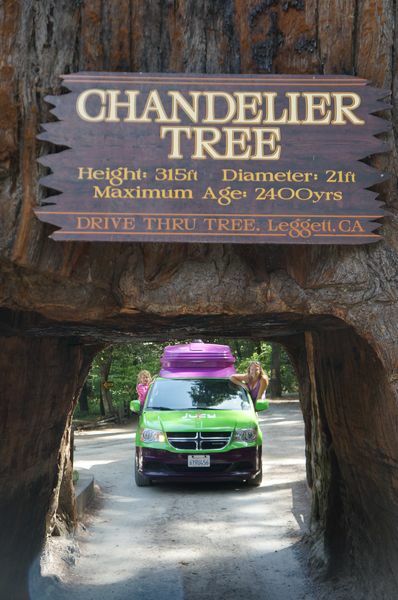 BEAUTIFUL drive for sure and what a great adventure and memory making trip for your family! I have almost identical picture of the Oregon Coast with flowers in foreground :-) There is a gorgeous pull off near Depoe Bay that is absolutely stunning also. Enjoy and I will enjoy following along on your journey now. PS, I totally need to get one of those campers!!! That van kills me! How much fun is that - the kids looked like they loved it, now I have to check out the rest of the adventure. Seattle and Portland are gorgeous. Love that drive so much!